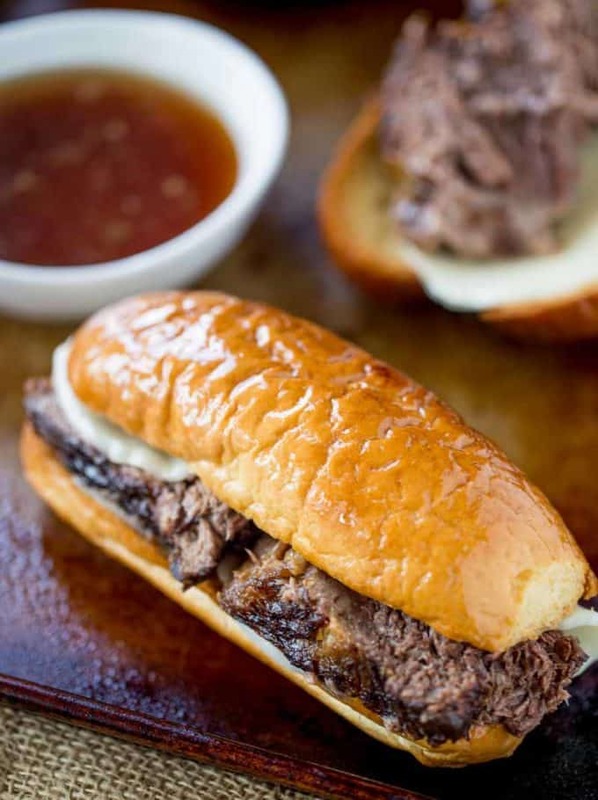 Slow Cooker French Dip Sandwiches are late to the game on this site. They are actually one of the first slow cooker sandwiches we used to make when we first started dating, but back then we weren’t quite as well versed in all the awesome tips in how to make them even more amazing. 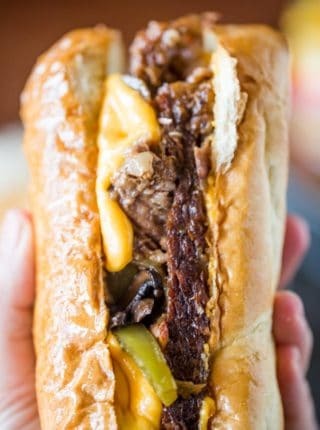 The recipe for Slow Cooker Philly Cheese Steak Sandwiches which posted earlier is actually based on our recipe for this post as well as the grilled cheese sandwiches. 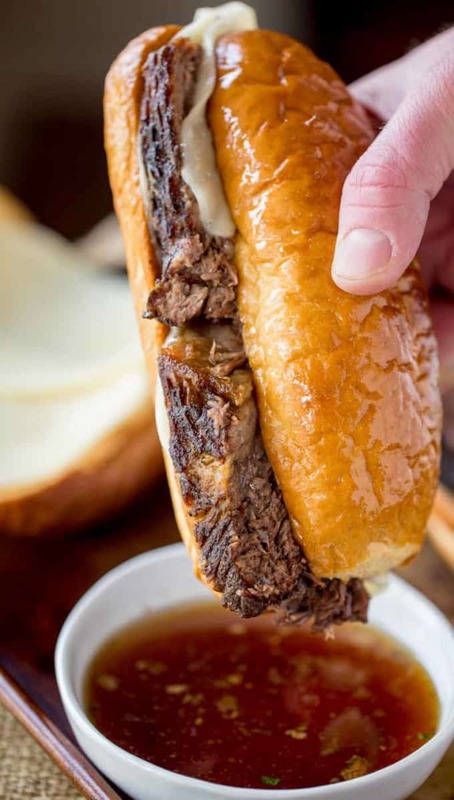 The beer in this Slow Cooker French Dip Sandwiches recipe is the secret weapon to this sandwich. 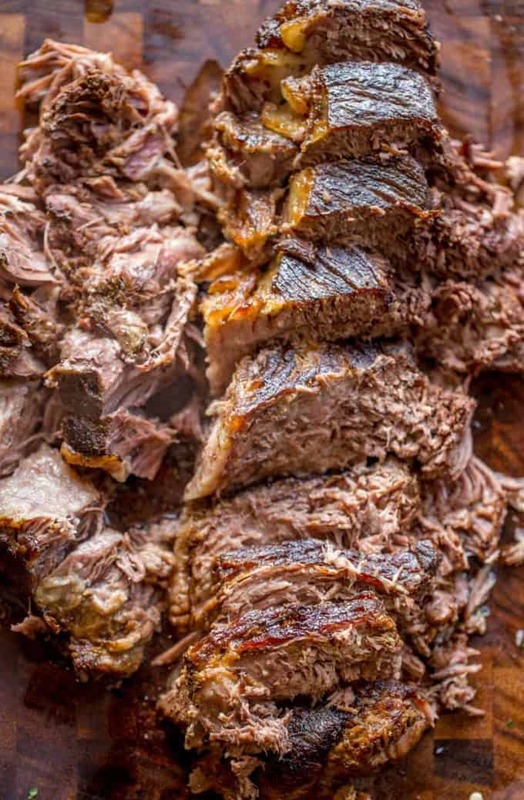 In a large dutch oven, brown the heck out of the beef on both sides and season aggressively. Use a darker beer for more flavor if you’ve got it. If you want to avoid beer altogether use additional beef broth. Butter the rolls before toasting, they taste amazing buttery and toasted. Dip the meat slices in the slow cooker liquid before adding to the sandwich if you don’t want to dip the sandwiches. Let the meat cool for ten minutes before slicing, this helps it stay together more. There are some recipes that use beef consomme or onion soup mix. Those are totally fine to use, you can swap out the consomme for half the broth or add the onion soup instead of the fresh onion, but this way is going to make an amazing sandwich, I pinky promise. Make sure you’re using a chuck roast for this recipe, using cuts that are leaner will result in tougher meat. Add the Kosher salt and pepper to your chuck roast. Brown on both sides aggressively (3-5 minutes on each side). Don't move the beef before flipping (this lets the meat get a deep crust). Remove the meat and slice thickly. End result was TOTALLY AWESOME! Only additions made was that I experimented with stuffing the roast with some PICKLED GARLIC, which I bought at a Farmer’s Market earlier in the morning! Once I added the browned roast to the slow cooker, along with the pan drippings, I added a little Liquid Smoke to the ingredient list, put the cover on, and impatiently waited for a little slice of heaven! Then when done, I place a few provolone-layered ciabatta sub rolls in the oven to toast. (Since Ciabatta bread has a crusty type texture to it, I find it doesn’t get as soggy like regular French bread will, after you introduce the gravy. The additional ingredients definitely kicked up the flavor of this recipe by a couple of notches! Will definitely make this again, and again! This recipe is a keeper. Everyone loved it. We used brioche slider buns and broiled them in the oven with cheese. Would be great for a party. This was delicious. It was very easy to make. When I toasted the rolls I made them into garlic bread with cheese. They are definitely a remake. Hi Sabrina – recipe looks so good I can’t wait to try it. I wanted to pass this along if you like horseradish there is a stand at Central Market in Lancaster PA called Long’s horseradish. Five generations thus far. They grind the horseradish right there in the market and they have a fan running. You can smell the horseradish all over the market. Check it out and if you ever get to Lancaster pay the market a visit – it is a real treat! Good sandwich very tasty ! Sure 🙂 Once cooled, place together in freezer-safe container and freeze for up to 2 months. Allow to defrost in fridge overnight and then reheat on stove. I just responded to your original post about substituting with broth. As far as using beer, I really like Strand Brewing Company but I know right now, they are limited to Southern CA. You can always use Guinness for a dark ale as well. That’s usually a bit easier to find nationwide. A can of beer is usually 12 ounces so if you’re using beef broth instead, just add a additional 1 1/2 cups of broth. Hope this helps! Delicious! I added garlic, crushed red pepper and dried basil, just because I’m Italian and can’t help myself. Now I get to use the leftovers in a ragout for pasta. Thanks for such a yummy experience! Those sound like delicious additions, Pat! Sabrina this recipe is making my mouth water! So if I want to make enough for 12 sandwiches, how much meat do you think I need? I was not a big fan of French dip until I made this recipe. My family loves it and I must say the flavor is unbelievable. Definitely a keeper and it will be in on the table again and again. Thank you so much! Glad I was able change your mind about it!! Loved this recipe. I added a bit of green pepper and mushroom and ran out of yellow onion so used some green onion. You are right. The beer does the trick! Cooked it 6+ hours for pull apart tenderness. Thanks for coming back to let me know how much you enjoyed it Ken! Tasted great, however, using the Chuck roast, as others have said, it’s not “sliceable”. It falls apart taking it out of the crock pot, out of the sandwich, well…you get the picture. What can I do to keep the sandwich in tact, and make it “stackable”? I haven’t tested it but my gut is telling me that you could cook on low for 5-6 hours. It might be tough since it’s not cooking down as long but if you slice it really thin against the grain, it would make it “stackable”. It might have some fat still on it because it’s not broken down from cooking a shorter time. I’d love to know how it turns out if you decide to try, thanks! I HATE french dip sandwiches. First I don’t like soggy bread and second there is never any flavor. Not this one! My hub’s said, “Cindy, YOU eating a french dip? Never thought I’d see the day!” Awesome! I am loving this!! You really just made my day! Thank you so much for the 5 star rating. I made this recently with the dark ale, it was FANTASTIC!!!! I will definitely make this again! This is delicious! I’m not a beer drinker but I have beer around my house just so I can’t make these sandwiches. Simple & delicious, you can’t beat that! 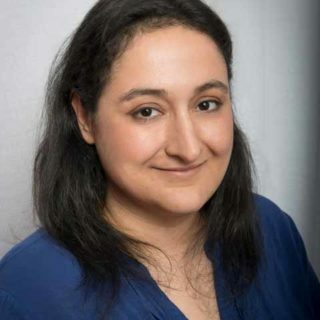 Thank you so much Marcella! So glad you enjoyed them! I’m hoping to make this recipe and that it will leave me enough for a second (freezer) meal. We have a baby coming in a few weeks! We are a family of four, kids ages 6 and 3. Based on how much this feeds your family, do you think a 3-4 pound roast would leave leftovers for an entire other meal, or should I also add maybe a 2 pound roast just to make sure? First off, congrats on the baby coming!! So exciting! The 3-4 pound roast might be enough for two meals depending on how much your kids eat or how big your sandwiches are but if you decide to make the extra 2 pound roast, I would suggest making it separately vs putting them together in the same slow cooker. With both in there, it will fill up the slow cooker and the meat will end up being more boiled because of the liquid being higher. It’ll still taste great but will have a different look to it. We also have a family of 4 and usually a 3-4 lb roast will maybe leave 1, sometimes 2, extra sandwiches for leftovers. Only 3 of us eat it though. It’s that good! But from my experience, if you make another 2 lbs, that should be enough to feed your family for another night. We just had a baby on Feb 1st ourselves! Making our family of 4 a family of 5! Congrats on your new edition! Thank you for sharing your wonderful recipe! 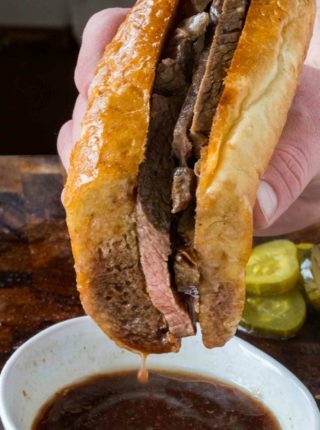 I make a French dip that’s similar and it’s my most requested dinner. To make the au jus yumminess I add one can Campbell’s French onion soup, one can beef consumme’, packet of Lipton onion soup mix to the crockpot. I also season the meat with sage and thyme before cooking. I toast the rolls and add provolone slices to each roll once toasted, just before layering on the cooked meat. has anyone ever tried yuengling lager? I am cooking this now! It smells so amazing & I cannot wait to try it! We weren’t able to add the beer, but I added several cloves of garlic, 2 extra onions (to give it more of that homemade French onion soup taste), and will be using havarti & Munster cheeses, which I will melt under the broiler on low for a quick minute or two. Once it’s finished, I’m going to add some of the au jus to a sauce pan & reduce it a bit so the sauce will stick better to the sandwiches & develop a bit more flavor. 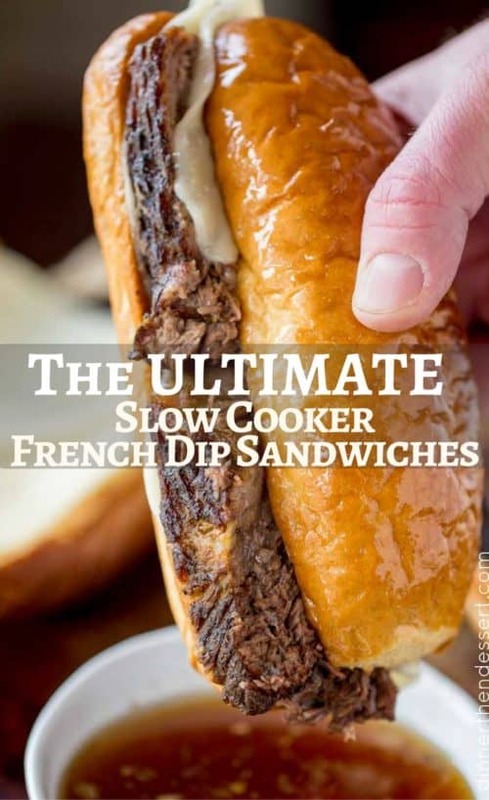 I have a feeling this will be my go to recipe for French dip sandwiches from now on! From what I’ve tasted so far, it is absolutely divine! I will definitely be adding the beer next time. I just made this on a whim with what I had on hand, but will definitely plan it out next time so we can try it with a good dark ale. Thank you so much for this recipe! 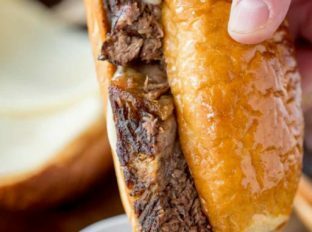 I am bookmarking this page now & will definitely be trying out your Philly cheese steak & roast beef w/ horseradish sauce recipes very soon! I’ll update you on how it turns out this evening! You’re welcome, Jasmine! I look forward to hearing what you think! Thanks, Sabrina! The meal was such a hit that night, I’ve already made it several times again! It’s become a steadfast part of our family menu. Lol. I just add an extra onion w/ some mushrooms & LOTS of garlic (I sautee half of this mixture in butter & Olive oil until the onions are golden brown to give it a delicious, caramelized taste. It adds so much extra flavor! I then add that to the crock pot, then brown the roast in the leftover butter/Olive oil ) & it comes out absolutely perfect every single time! I also started using French bread to help soak up the juices better & to keep the sandwiches from getting way too soggy. I also slather on some mayo that I’ve added minced garlic to, before I toast the bread, & that little bit of fresh garlic adds even more flavor to complete the sandwich! Yes, I seriously love garlic! This recipe never disappoints! Even my picky son loves it. You just absolutely made my day!! Making this recipe for the second time in two months. This recipe is a keeper! Delish! Thanks for sharing it! Amazing tasting sandwiches and so easy to make! The hardest part was smelling the deliciousness all day as it cooked. Don’t skip the beer….it adds another layer of flavor that is outstanding. Next time I make these, I’m going to find a recipe for a creamy horseradish sauce to slather on as well. 10/10 will definitely make again. Thanks so much for sharing the recipe!! Hi!! How exactly did you toast the rolls? And did you put the butter on top of the hoagie or on the inside after you cut it? I opened the hoagie rolls, buttered the inside and placed them in my toaster oven until perfectly toasted. I hope you enjoy them! Has anyone tried it using sliced onions instead of diced?…..just curious (I know it won’t make any difference in the flavor), because I was thinking if they held together at all the sliced onions would be great to heap onto the sandwiches along with the meat. Of course, as much as I love onions I may double the amount in the recipe…..but will most likely just make it exactly to the recipe the first time. You can definitely slice them too! Enjoy!! Can you cook in instant pot pressure cooker? If so how long? I haven’t tested it in a pressure cooker so I don’t feel comfortable making recommendations. I’m sure you might be able to find some suggestions online that would have the same ingredients to try and follow. Sorry. Slow cooker? Ain’t nobody got time fo dat. At least not me. Can I pressure cook instead? Haha! You can definitely use a pressure cooker instead but I haven’t tested this recipe using one yet so I can’t give a recommendation on timing. I would suggest finding another recipe that’s similar and using that as a reference. Can I do this in my crock pot on high for 3 hours vs low for 6 hours?? Most of my slow cooker recipes allow for either setting, but this looks amazing and I would rather wait an extra day than rush it if u think the flavors won’t be infused enough cooking on high?? Thanks for the recipe….super excited to try this! Thanks, still didn’t get to it today, but everything is ready and waiting for the morning!! And by the way, My fiance and I, along with my 3 year old absolutely LOVE the Philly steak Grilled cheese recipe. My daughter loves when I make recipes that have cooked onions & peppers in them. A girl after my own heart, so we will definitely load up this French dip with some caramelized onions & cooked peppers. That is truly a blessing because I know how hard it can be at times wit picky eaters! So glad you’re getting to enjoy all the recipes! This recipe looks delicious and I am trying it this weekend. Can’t wait to try it and share my thoughts. I have a very delicious recipe I would like to share. I use a whole pork loin, seasoned with Zatarrain’s, lemon pepper seasoning, liquid smoke(either hickory or mesquite). Dice garlic, a bit of onion into roughly the same texture. I like alot of garlic but add to your taste. Take a knife and make X’s and inside push the garlic, onion. I wrap it in plastic wrap and leave it overnight but you can let it sit in the refrigerator as long as you like, the longer you leave it the better the flavor. Take it out, brown it whole and place it in the slow cooker, fill with chicken or beef broth until the pork loin is covered. I usually leave mine in the slow cooker overnight. When you wake up it will be fully cooked. Remove the pork loin(do it carefully as it will be falling apart). Pour the broth through a fine mesh strainer to catch all the good bits, using two forks pull the meat apart using two forks in different directions. Place the pork loin back in the slow cooker with the good bits. Set aside the broth to cool. Once it’s cool I save it in the fridge for another yummy meal. Pour in your favorite BBQ sauce, use your judgment on the amount. I use Sweet Baby Rays honey and brown sugar. Allow it to cook slowly for two hours or until your tummy can wait no longer. Here in South Louisiana where I am from I use crunchy, fresh French bread to make poboys(it’s a Louisiana thing). I can assure you, you can’t go wrong with this recipe. I first came up with this recipe off the top of my head and thought it would be something I would make once or twice a year but my children would have none of that. They asked for it once a week sometimes and I thought they would eventually get tired of it. They haven’t and their spouses and grandson’s say it is their second favorite dish that I make. #1 is of course my chicken and sausage gumbo. It’s a South Louisiana staple. Hope if anyone tries my recipe they enjoy it too. Thank you so much! I’m sure your recipe is fantastic!! Got to give Keisha’s Pork Loin Recipe a try. That sounds sooooo good, and ya “Louisianaians” got to stick together! But I have a question for you Keisha. When you season your loin before placing it in the fridge, you only use Zat’s Lemon/Pepper Seasoning & Garlic/Onion? This was delicious. I used a London Broil because that’s what I had on hand. It came out nice and tender. The only difference was the meat shredded instead of being sliced. I also deglazed the pan with some broth after browning the meat and added that to slow cooker. This recipe is a keeper! Your recipes never disappoint! Thank you Sue! That does sound fantastic!! Thanks, that’s what I have, so I’m going to give it a try. I’ll let you know how it comes out. Your recipes are fantastic. 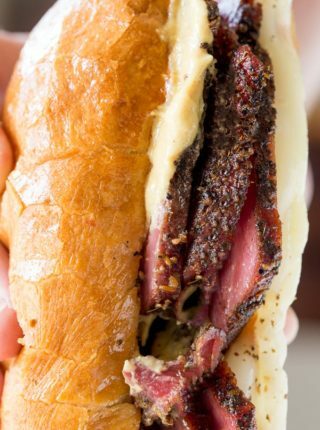 Two favorites are the pastrami and the turkey breast sandwiches. what temp did you cook it on in the dutch oven? When I do roasts in a dutch oven I cook them at 325 for 3-4 hours. Can I substitute London Broil for the Chuck roast? London Broil is a leaner meat so it may not be as tender. Making this today. Can I use a Bud light instead of a dark beer? It’s what I have in the house. ?? I’ve never tested that before but I believe Bud Light has a different taste than dark beer. You could definitely try it and let me know how it goes or just leave out the beer completely. Either way, I hope you enjoy! I kept my roast in longer on low because my husband wasn’t in from work. you have cranky husband and nice husband. mine came in cranky; he tasted the au ju and complained. (yeah screw him lol) The rest of the family made their sandwiches. Oh it was a hit!!! Oh and arse wipe had one and he was raving, but he doesn’t matter since he was a jerk lol Now what matters!!!! I dunked mine in my juice and took a bite. Ooooooooh man it was soooo good! The flavors melded together into a crispy, meaty, cheesey full of flavor saucy goodness. Yes I will make this again. I was pouting. but didn’t say anything, because we had a little more than a 2 lb roast. (I kept it on low until hubby came in, which was about 9 hours and it was still great. keep it plugged up) The time and temp were still great. It was probably better. I compensated for lack of beef amount the recipe called for with Beef Broth/Bullion. (I am going to throw a tantrum because I have had my several recipes ready to cook in a row then life happened! I finally got last one, entree, done. I haven’t looked for the last few days and don’t have a clue what to make for dinner tomorrow. Dessert will be flourless chocolate cake or flourless chocolate chewey cookies if I get to dessert lol) Oh Sabrina!!!!!! How you make my life happy and easy. You make me look good!!!!! Looks yummy….I’m not a beer person… what type of beer should i use? You’ll want to use a dark beer but if you’re not a beer person, you could leave it out all together. Hope you enjoy it either way! Dark beer like a stout? Or just a dark ale? I asked this yesterday, but don’t see it on here, if I can’t add alcohol, do I just replace that fluid with broth? Thanks, making this, this week! If I leave the beer out, should I just add more broth? You can either omit it altogether or add more broth if you want. Enjoy! This looks amazing! It would be perfect for my lunch! Nice and juicy. Just how I like these type of sandwiches. These would be the perfect lunch for my kids. Keeping this recipe! 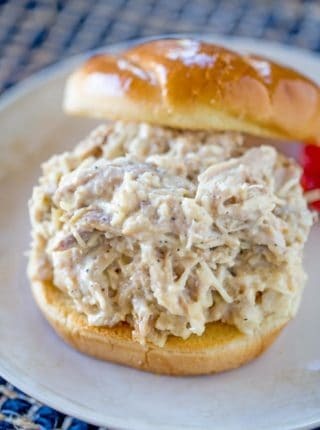 This is one of my husband’s favorite sandwiches! 🙂 I am going to have to give this recipe a go soon. Sounds like this is definitely one of those tried-and-true recipes! It looks absolutely delicious! My family will devour these sandwiches. I seriously LOVE your “tips” section! I’m DROOLING over these sandwiches! I haven’t had a French Dip in so long, and clearly, it’s time to fix that! Yes, get right on that!! You won’t be disappointed!